All you fashion buyers out there, ever looking for a simpler way to streamline your entire wholesale clothing buying process? 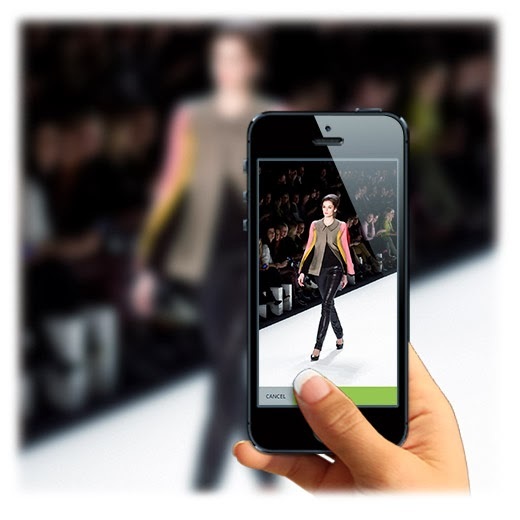 iMerchandise has come up with the perfect app to help you in your fashion adventures! No more wasting time with line sheets and order forms. No more cutting and pasting your favorite designs for your vision boards. The iMerchandise app takes care of all of that for you! Sounds to good to be true? Well in this case it is not! CEO and Founder of iMerchandise, David Secul created this app for his personal use and realized there was a niche and need in the industry. Now it is available to help other retailers and personal shoppers. 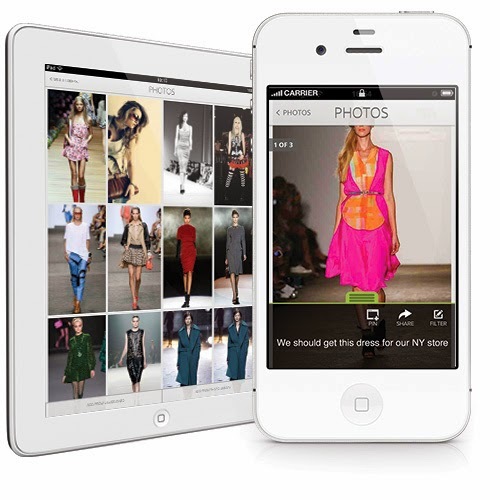 With the Fashion Weeks starting next month this app is a must have! Easy to use and saves so much time so you can enjoy your spare time out and about, rather than sorting through orders and doing all that writing you typically do. After downloading iMerchandise, start by creating the events that you will be attending. Make sure you have that schedule out so that you can create your boards ahead of time. You can customize your boards by designer or brand, or any way that is easiest for you. You can always add boards on the spot as well. Once your at your scheduled event, the fun begins! Open your iMerchandise app and open the event that you entered in earlier, and start getting use of that camera! Take as many photos as you need and when your finished just hit done and all your photos will appear. Assign your pictures to your customized boards. You can organize your photos any way you feel is best for you. There is even a feature to filter your photos that changes the lighting, if you decide you want to see an image in black and white. You can add notes to each photo, share it on Facebook, Twitter, Instagram, email and there is even a print option! The rest of the process is probably the most time saving feature for all you buyers. Easily create a product from your photos, assign a style number, a shipping date if you choose, along with the purchase price. You can enter in the preferred MSRP and it will automatically calculate the retail price for you! Customize the product by event and category ie. Dresses, handbags, accessories etc.. If your specific category is not already in the pre-filled section, add your own. Assign the product supplier, iMerchandise already has an extensive list of suppliers, but again if it’s not in there, add your own. If your wanting a specific color or size that is in there too! The size charts include all sizes in EU, INT, and US. The buying process is very simple and leaves virtually no room for errors. If you have done all the steps above all you have to do is click the image of the product you want to order. Enter in the quantity and simply email your order to the supplier. 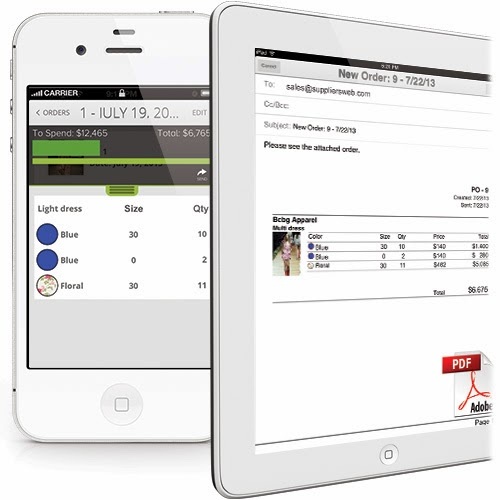 The order is sent in a PDF file that displays all the order information along with your photo. Another great feature is the budget feature, no more over spending, set your budget for each month and it will calculate what you have spent and what you have left! No need of stressing out when ordering from numerous designers this app is perfect to keep you organized and helps save you time in the long run. iMerchandise keeps all your information in one place, and acts as your virtual personal assistant. 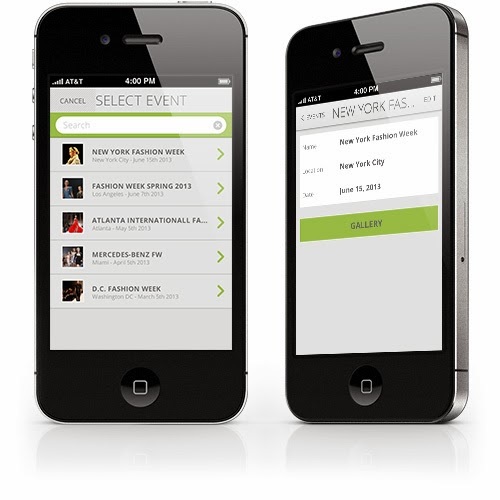 The app is meant to work seamlessly, even if vendors use fashion platforms, paper or email you sheets. You will not be disappointed! The video below gives you a sneak peak of the app, available on iPhone and iPad now! Oh yea did I mention that it’s FREE? Fashion Week just got a whole lot easier!